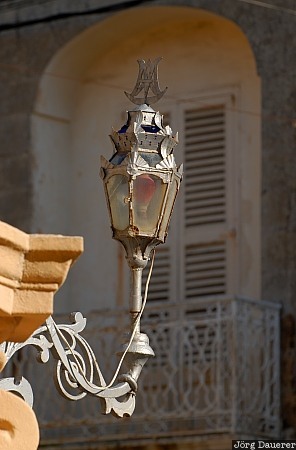 An old street lamp in the city Balzan illuminated by soft afternoon light with a balcony in the background in shadow. Balzan is one of the "three villages" in the central part of the Mediterranean island of Malta. This photo was taken in the afternoon of a sunny day in March of 2009. This photo is part of the exhibition Street Lamps (July 2008). This photo was taken with a digital camera.